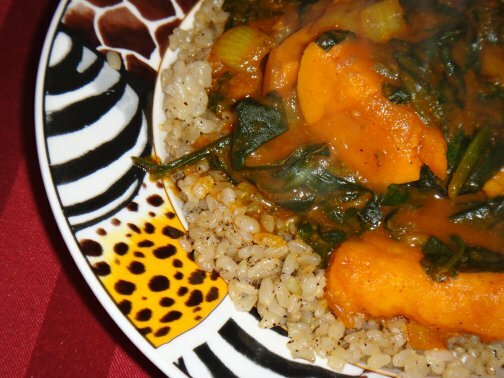 Easy Gourmet Recipes - Sweet Potato Spinach Curry Recipe. Healthy natural recipes including breakfast recipes, appetizer recipes, soup recipes, pasta recipes, holiday recipes, party recipes, dessert recipes, gluten-free recipes, raw recipes and budget recipes. Prep Time : 15 mins | Cook Time : 30 mins | Servings : 2 and you might have leftovers! As are all my recipes. I tend to shoot for 2 servings, but this very low cal dish makes enough for leftovers unless you are both VERY hungry! This recipe was inspired by the potato spinach curry in Appetite for Reduction (pg. 232). I think this is a little quicker and I hate potato chunks so it uses marinara instead of chopped tomatoes. I think that makes it creamier too. *NOTE* Also, this recipe is best if made ahead of time and eaten later/the next day. The flavors really have time to soak in that way. Or you could probably make it in a slow cooker, I don’t have one but this is an assumption. First, put 2. 5 cups water with a veggie base/or use veggie broth, in a medium pot. While waiting for the water to boil, peel your yams (1 very large or 2 smaller will do for two-three people) and chop potatoes into medium sized chunks. Once broth boils, add potato chunks. Add 1 cup marinara or crushed tomatoes. Since this is a quick/easy recipe, I just use canned marinara, Field Day organic is my fave, it doesn't need much tweaking. It doesn't have many tomato chunks, which I like. I like it smooth. Add 1 tsp garlic salt. Add . 25 tsp tumeric. Once all the ingredients are mixed together and have had a few mins to marry, then add 1 (or 2, depending on how much you like spinach, I use 2 generally), bunch of spinach (fresh/frozen is personal preference, I like fresh). Cook until spinach is wilty/creamy and potatoes are soft, but not soft enough to mash, you want them a little under cooked if you are letting this sit for a day and reheating, but if you're eating it right off, then cook them fully, but so they are still firm.